Well, it turns out that the smaller & lighter vDSLRs can indeed offer many of those features, by throwing away the notion of smaller & lighter. So I wish people would stop touting it as a “you get smaller & lighter AND you get real pro camcorder features.” Here’s a list of for-instances that I’ll gather and add to over time because this notion that vDSLRs are smaller & lighter, and even CHEAPER in any way compared to a prosumer or professional video camcorder. Here’s an article from December 2010 DV Magazine about videographer Mike Slee and his Red Rock Micro rig that he developed for shooting videos among troops. The mid-range DSLR hurdles a number of obstacles presented to Slee in past missions, particularly issues with space and maneuverability, as well as issues with visibility…. Because DLSRs aren’t designed to be operated like a video camera, Slee needed a handheld rig that would make DSLR shooting easier. How is this smaller & lighter than a handheld prosumer camcorder? Slee uses custom thermal-molded RAT Grips instead of the rubber Redrock handles, and generally uses shorter rails than what a given configuration will call for.) “It has to be functional to the environment I’m in,” he explains. Slee is comfortable with the lightweight Running Man configuration but prefers his personal version of the Field Cinema Deluxe Bundle, where the camera is offset to the left of the shoulder mount, with the monitor positioned above the follow focus on the left side of the camera body, and a full-size V-mount battery mount is attached to the shoulder pad. This vDSLR rig makes a tactical rifle look small. Now, add the cost of the monitor, hood, velcroed power supply, Sony battery, Zoom audio, shotgun mic, shock mount, black cabling, tactical Red Rock Micro setup, Sennheiser wireless, Sony headphones, special handles, extra rods, and you’re well beyond the cost of an EX1 which is probably half the weight, and a a third the size. Plus, this rig doesn’t look very rugged– a trip to the ground will have all the various little 1/4-20 threaded accessories flying off their mounts. Robert really enjoyed shooting with the 7ds, he said it took him back to his El Mariachi roots and was really happy with the end results. He loved the ability to just jump out and grab the shots in a short period of time, switching between the big sniper rig and the simple Zacuto Z-Finder rig. The cost of the accessories is several times the cost of the camera. Wow. That's a lot of gear. …those are my 7D rigs at work. After seeing all the questions, I thought I might shed a little light on the subject. The rig Robert is using was set up to allow him to see an HDSDI image on a 7″ Panasonic onboard monitor while his AC (the insanely talented Sebastian Vega) pulls focus with a Preston FIZ from a 17″ Panasonic monitor. Very necessary as you know when shooting on a 200mm at a 2.8. The signal was split from HDMI to 2 HDSDIs using the Aja Black Magic powered by a Nebtek adapter and Sony M batteries. Both the Preston and the onboard were powered with a D tap cable and a Sony onboard battery. A key takaway here is that, despite hearkening for his “El Mariachi” roots, he’s got full HD split out, someone else is doing DIT and pulling focus remotely, and the whole setup is as far from a single, wind up 16mm Bolex as you can get. The RIG and Video Village. I’ve shot with vDSLRs. I love the look. But getting a good look takes careful preparation and execution. I tested the Ziess glass– 450° of focus rotation is just too much. You have to be mindful of moire and aliasing that may in some instances appear in your images. But most of the time the look of vDSLRs warrant their use. I have no problem using them when appropriate. Just as I have no problem using the truly smaller & lighter GoPro Hero, when appropriate. But I will never tout the Hero as a replacement for professional camcorders because it doesn’t do everything a pro camcorder does, as easily as a pro camcorder does. Neither do vDSLRs, and I wish proponents of their use let the cameras rest on their merits- a unique and stunningly beautiful look at a fraction of the cost of shooting 35mm film- and stop touting features that simply don’t exist. Saw this vDSLR frankenrig promoted on Vimeo. And by promoted, I mean the builder is proud of his work. And what is the setup time for this monstrosity? But wait, there’s more- video of the rig in action!!! How about this simplified instruction on how to shoot video on the recently introduced Nikon P7000. Let’s cut to the chase. Shooting Video. Set your menu to 1080P: MENU-SHOOTING MENU-MOVIE SETTINGS-MOVIE QUALITY: 1920X1080; 24 fps; high quality. Be sure to choose MANUAL MOVIE SETTINGS: ON. Set your lens to manual focus. Although the D7000 handles auto-focus while shooting video, manual focus gives you more control. Same with exposure. Set your ISO first: push the ISO button on the back, and rotate the MAIN CONTROL DIAL with your thumb. Next, set your shutter speed to 1/50 by rotating the MAIN CONTROL DIAL. Set the aperture with your index finger on the SUB COMMAND DIAL located below the MAIN ON-OFF SWITCH. Tweak other settings like Color Temperature, Audio (Microphone), and Destination (Card Slot). Turn the LIVE VIEW (LV) lever in the direction of the arrow. The image is displayed on the 3″ LCD viewing screen. To begin shooting video, simply press the RED BUTTON inside the LIVE VIEW lever. To stop shooting, press the RED BUTTON again. Still pictures are taken with the regular shutter release button while in LIVE VIEW. Rotate the LIVE VIEW LEVER in the direction of the arrow to exit. It’s all very intuitive. You can shoot about 20 minutes per clip; there’s a count-down timer in the upper right of the LCD screen. THERE, that is so much better than taking a Canon XF300 out of the bag, turning it on, and hitting record. Fewer buttons than a real camcorder means trips to the menu. What I like most about this cage is that it so tightly adheres to the GH2’s small form factor and shape… Handheld with a shoulder mount, follow focus and handles, footage gets a huge boost. All the usual handheld jitter is gone, the unnatural floating feeling of OIS is gone, and yet the rig is still incredibly compact and light compared to a ENG shoulder cam for broadcast. Yea, just like an on-shoulder camcorder... except it's not. Shoulder mount and follow focus. Okay, you’ve added mass for stability and follow focus so you’re more easily able to roll focus, but you still can’t zoom. Put it down, the adjustment for the shoulder makes it wobble. There are no microphones except the cruddy internal mono mic right now, no mixer, no XLR, not audio solution here at all. Let’s be honest; “Incredibly compact and light compared to an ENG shoulder cam for broadcast” True, but all you have is image. Nothing else. By the time you rig it out to do everything an ENG camera can, you got the same thing- actually, compared to velcroing two receivers on an ENG camera, I think frankenrig looks and operates much worse. Try feathering a smooth zoom onto your subject while racking focus and opening up the iris- the viewfinder showing you critical peaking for accurate focus and internal waveforms showing your light levels… and the built in speaker next to your ear confirming not only good audio, but that the zoom is motivated by what the actress- some 20 feet away, is saying. Frankenrig? Impossible. ENG? Every single day. The rectangular shape of the F3 and AF100 is simply a relic of the past and what people expect a ‘pro’ camera to look like. There was some good thinking in the AF100 design with the removable handle though. …they will become an option rather than de rigueur, and there is absolutely no need to have the core chassis of a video camera bigger than it needs to be. You just have to ask what the point is of making the core of the camera smaller if you then have to buy rigs to attach everything you removed so the camera is actually able to do everything you need it to do. Why not just have a bigger camera with XLR audio, on-shoulder, and a handle on top to begin with rather than taking it off and then being forced to buy it again from a 3rd party provider? Don’t need a handle? But then how would Red Rock Micro & Zacuto make any money? This is Red Rock Micro's DSLR home page: Jan, 22, 2011 - Can you HANDLE it? 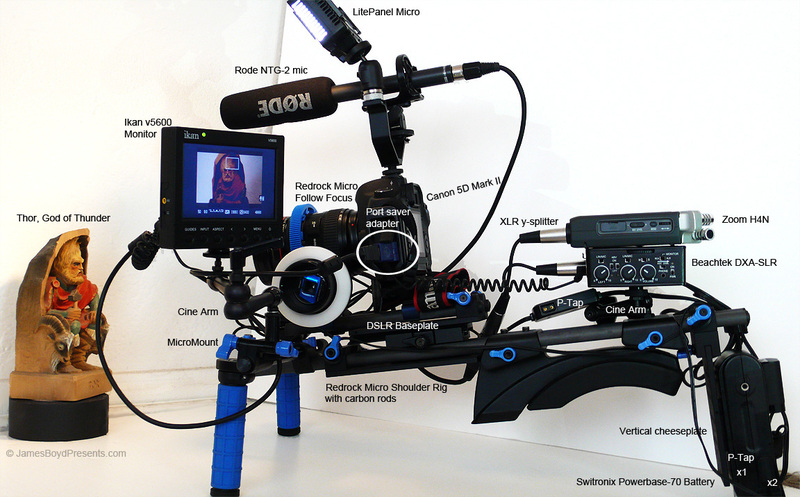 In a Red Rock Micro forum, a user showcases the evolution of his on-shoulder system, including wireless receiver, audio recording, on-camera mic, monitor and camera. It’s a nice setup. And it conveniently fits into FOUR Pelican cases. One man, four cases and a half-hour of setup. In the bag & ready to go. The battery is even on the camcorder already. You can pick this up, put on the tripod, and in 20 seconds, get your shot. Do vDSLR’s enable the solo shooter? Check out the above rig’s setup instructions here. Do you spend more time making sure the shot is right, or the rig is put together right? How quick a transition between tripod & handheld? When you are done, how long is your tear down? Is a shallow depth of field, at the expense of everything else, really worth all this? A comment here and a twitter response, independently, both proffered an article about “covert” shooting in Burma. When I read the article, looked at the photos, and watched the video, I took away something completely different than the people who proffered it in defense of smaller vDSLR configurations. I saw video where there were other prosumer camcorders in almost every location where Aung Sang Su Kyi was. The vDSLR didn’t offer any advantages that I could see in those locations. Then the article goes on to talk about “Dodging the authorities was not our only problem. We were also filming rebel militias in the jungle, capturing gun battles” but was this done covertly? No. Because the article shows the crews displaying their technical gear (several cases & bags of it) to the impressed rebel militias. I bought a Canon 5D Mkii and spent many hours fine-tuning my newsgathering set up. Not easy with so much misleading nonsense on the internet. The more control you have over your shoot, the greater your chance of DSLR video success. For random videos set to music the end product using a 5DmkII is often a wow. Failed and missed shots can be glossed over. But with newsgathering there is often little or no control of your subject. DSLRs are a compromise for video, but for Burma they were the key to getting the only HD pictures. Later he explains that all the other news organizations were using palmcorders. The video shows lots of other recorders, still cameras and even phones- all of which, today, can shoot HD video. So I don’t understand how the vDSLR was the only way to get HD video. My advice for news is to avoid ridiculous oversized DSLR rigs. The Christmas tree look isn’t practical and you want to be able to turn round in corridors. I found for me there is little point in having lenses faster than F4. Image stabilizing is the essential factor… Having to change lenses is a tremendous pain, not just in dusty conditions … I did miss the longer range of my broadcast Canon HD lens. My least favourite thing was using the essential Canon 5DmkII focus assist and realising that the zoomed in shot I could see on the screen was the one that I wanted, but that I didn’t have the lens to shoot it! Shooting at F4 with longer lenses still gives an extremely narrow depth of field. Unless your subject is sitting in a Victorian photographer’s neck brace the chances of nailing a shot at F1.4 are slim. The 5DmkII’s LCD screen is good, but the Zacuto Z-finder I found disappointing. Compared to using a proper ENG camera’s viewfinder, following focus and setting exposure are absurdly tricky. I also don’t understand why pro-photographers accept cameras that can only give a low level shot if you lie in the dirt or that require a step-ladder for an angled down top shot. The Zacuto finder doesn’t help here. I think it is over hyped and I’m looking for a better solution. A Canon D60 would help – or any consumer, prosumer, or pro camcorder has a rotatable screen / eyepiece. I confess we used a regular DV camcorder to do our videophone lives; including in night vision mode after dark. The Streambox live software in our MacBook Pros requires the use of a firewire connector, which the Canon 5DmkII does not have. I did a few excursions to record the gun battles … the Juicedlink DTD454‘s output mini jack got knocked. … the output socket had broken and gave only intermittent sound to the 5DmkII. … I could do nothing but weep when I later realised the entire sequence of thousands of refugees streaming away from the fighting was mute. Audio is the issue with the 5D and it’s no joke when things go wrong Manual sound was now seriously handicapped with no way to monitor sound at all. In Rangoon all the international media were there illegally. All the other broadcasters were using mini-sized palmcorders and our 5DmkII’s were definitely going to give us better pictures if we could pull it off. As a news shooter, your priority should be that you can get the shot, not that you got prettier pictures. Duncan and I posed as tourists with our cameras and dodged the military intelligence and plain clothes police who were on the streets in large numbers. Militia and their leaders are not idiots. They know video can be recorded with phones, cameras, etc. I had run with my gear three kilometres … I was very glad I was holding a lightweight 5DmkII. … the crowd surged. I ramped up the ISO, switched on my Z96 LED … how amazing it was such a moment was lit by a small and inexpensive LED light! So a camera light was needed anyway. Not an available light shot where only vDSLRs like the Nikon D3s need apply. And the 5D + rig + light is not as light as a small prosumer camcorder. half way through the presser my mini jack cable was torn in half by the force of the scrum. I removed the minijack from the 5D and we recorded the remainder of the presser on top mic alone. Fortunately we’d done a piece to camera earlier among the crowds of supporters outside. Because the built-in audio is unusable? Saying shooting video on a stills camera is a compromise is a bit of an understatement. Duncan was using a Tascam DR-100 audio unit to record sound separately for voiceover and without it we would have been in trouble. I still want to record audio direct to the CF card so I can be better placed to do quick edits without the need to find and sync separately recorded SD audio files. Try using a video camcorder. 5DmkII with 24-105mm F4L IS and fitted battery grip, 70-200mm F4L IS. Old Zeiss/Contax 25mm F2.8 and 50mm F1.4. Delkin dual battery charger, six Canon batteries, Juiced Link DT454 mixer and 9v batteries, headphones, Zacuto Z-finder, SmallHD DP6 Monitor and ball and socket connector, custom Redrockmicro gunstock rig, six CF cards, Genus Fader ND, Sonnet dual CF card reader, Schoeps shotgun mic and hot shoe bracket. Tram TR-50 lavalier mic, various XLR cables, small F&V light Z96 LED light and ball connector, reflector, 15inch MacBook pro and hard drives. How is this more covert than any of today’s prosumer camcorders? How long did it take to “gear up” from packed gear to cover live events? Canon offers an almost identical model to the JVC on the right that also shoots in complete darkness with IR lights. Panasonic also offers a detachable handle model for the “consumer look” when needed. There are also high end consumer models (much less expensive than a vDSLR) that have a mic input. Best of all, there’s headphone jacks, reliable, rugged XLR jacks, audio meters, video scopes, flash media, a handle to mount the wireless receiver, a rotatable high resolution screen for high and low shots, an eyepiece for use in very bright situations, and the entire camera kit can fit in a big jacket pocket, not a big backpack and several pelican cases (as shown above). Again, this article was published on a site that touts the advantages of vDSLRs over camcorders. Yet this article espoused- in my mind- how much better a prosumer camcorder would have solved all of this news organizations problems. Want to make a movie- get a vDSLR. But for so many other uses, a vDSLR is the absolute wrong choice. Here is an opportunity to shoot video at the videographer’s pace. In a dim interior. Where you can retake shots, or reframe if there’s aliasing or moire. No flash strobing to worry about. No gear going to get broken or dropped in battle. Plenty of time to check audio on an interview. This usage is a vDSLR user’s best gig. Funny, then that Tony Umrany closes this article with: “it clearly has limitations in a fast paced news world. I’m looking forward to another outing to see what I can improve upon but I will certainly choose my stories wisely.” Or better yet, choose your gear depending on the story you need to cover. Another thing to consider is whether the purchase is for personal creative reasons (a hobby) or professional (ROI) reasons. I think this is a great question to ask because every site that talks about vDSLRs has a host of ads from companies that sell vDSLR accessories. I think back to how Fairbanks Alaska (where my father lives) went from a tiny dot to a major city in Alaska. It was because of several gold rushes in the area. Thousands of people flocked to the area (and by area I mean hundreds of square miles) but very few got rich finding gold (ROI). Those who did get rich are the storekeepers who supplied those “rushers” who rushed after every latest and greatest rumor of gold. For some professionals with established businesses, the vDSLRs are tools that will pay for themselves. For everyone else, the only people getting rich are those selling you all the accessories you need to try and make your vDSLR do what you want it to do. They LOVE this craze. They’ll fan the flames as much as possible (maybe even make some web video series all about vDSLRs and how good they are!) Because if they all say it often enough, you will believe that a vDSLR is indeed the camera you need. It becomes your “precious” (to quote Lord of the Rings) and you’ll do whatever you think it needs. I have nothing against the accessory makers. They make incredibly useful tools. But I caution those who lust after a camera thinking it’s a smaller, lighter & cheaper way to make professional video— I caution you that buying the camera is just the tip of the iceberg of what you may spend. Oh it just keeps getting richer. Even the proponents know vDSLRs are problem beasts. And still more. It just doesn’t end. February 18th, 2011’s post on James Boyd’s site talked about his Frankenrig, which he actually designed specifically to enable to do everything a regular camcorder would do. Best of all, he labels at least 16 of the more than 20 pieces it takes to make this usable. Really, by the time you are done here, the setup is not smaller than a handheld prosumer camcorder. It’s not lighter than a prosumer camcorder. It’s certainly not cheaper than a prosumer camcorder. The only thing it offers is a unique shallow depth of field. But that is a lot of gear to jury-rig for one camera feature. Moreover, you can now have that large sensor on various prosumer camcorders from Sony & Panasonic. 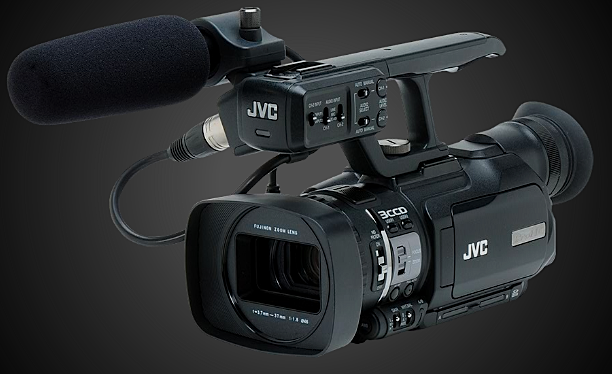 With built-in XLR jacks, professional audio control & metering, quality monitoring with scopes and peaking, focus assist, built in high quality stereo microphones and a clip to still add the light of your choice. So, yea, you’d still add the light. But everything else you could throw in the trash, if it didn’t cost so much. I could not agree more. I have a 60D, A Zoom H4n, an AT897 shotgun, 2 wireless Sennheiser lav setups, a Letus viewfinder and an offset shoulder rig to put it all on. It’s kind of Frankenstien looking. It’s cumbersome at best. The rig is NOT run-and-gun by any stretch. More slow and fragile with pieces hanging off small magic arms and cables running everywhere. The picture is amazing but sound is a complete pain. This is why I am keeping my XH-A1. The form factor is right and it is a workhorse compared to my vDSLR rig. Well, you can always start out with Sony’s NEX VG10, but for a $2000 camcorder, the reviews are looking pretty poor. I hold hope Canon takes their XF300 and puts a big chip in it. I am so much in agreement.. The past 2 weekends I have been the DIT for a tv pilot. I of course have to help set up equipment. We are shooting on RED MX with a full production team. It takes close to an hour with 25 people working to set up. A great deal of the set up is all the RED gear etc… I also own a Canon T2i. In comparison, the vDslr is much quicker and cheaper, we are carrying around $100,000 of gear location to location. I think we may have missed the point here. vDslrs are a cheaper alternative to the film production workflow-not the run and gun documentary workflow. Well, I hope you’re not saying the T2i is comparable to the RED MX. In reality, RED / vDSLR, when properly pimped, take about the same amount of time. I would never compare a T2i to a run-n-gun camera(HVX200, Sony EX1, etc), but I would compare them to a RED. The reason is that both cameras(T2i and RED) operator closer in comparison than a T2i and an HVX200. Of course the T2i has nowhere near the color space as the RED. The RED is much superior in all aspects except for the size and weight. If we compare the T2i and a HVX200, I think we are forgetting the reasons people “freaked out” over vDslrs; it has detachable lenses which can easily mean a shallow depth of field similar to cinema cameras. With standard video cameras you still have a very flat image. I do agree with you wholeheartedly that a vDslr does not make a good run-n-gun camera at all, unless there are no accessories attached. Couldn’t agree more with the criticism of unwieldily rigs, couldn’t agree less with the general thrust of this article Anthony! Check out Dan Chung’s DSLRNewsshooter for why the DSLRs are more flexible and less cumbersome than ENG cameras, from no less than a guest blog by a Sky News shooter, in a jungle, surrounded by militants, and then later covering the volatile release of the Burmese pro-democracy supporter Aung Sang Su Kyi in a country where outside broadcasters are extremely unwelcome. DSLRs are as light as you need them to be, or as feature packed as you need. They are flexible. An ENG camera isn’t. They are a break from past thinking entirely. As far as the rigs go – they are only as good as the designer. Some are very good and I’ll be getting deeper into the good ones in the coming months on EOSHD. Most of them, as you quite rightly point out are bloody awful! ReWo and SMM are on the right track though. Andrew, I follow your blog and love the finds you find! I’m especially looking forward to “pixel peeing” the 40fps GH2 footage you posted. But you (and others) have pointed that “Undercover” camera article for shooting covertly in Burma. IMHO, the MESSAGE is the absolute most critical thing there. Not large sensor, or shallow depth of field, but that there is any footage at all of what is being shown. And in that case, a tiny Prosumer camcorder (Panny, JVC or Sony) would fit in a jacket pocket and STILL offer XLR audio connections and a great image. In a jacket pocket is 1000x more covert than the big backpack of gear that had to be assembled by the crews in the article you referenced. When you’re doing something like that… you never want to say “IF” you can pull it off. Your emphasis ought to be on getting the shot. He admits that critical shots had no audio, dropping the rig, broke gear, no way to monitor audio, “Having to change lenses is a tremendous pain,” “I did miss the longer range of my broadcast Canon HD lens,” and they had to use a DV camcorder for certain uses- including streaming, nightvision. You do have some valid points. I’m happy to let them co-exist with mine. I think people have different needs out of the whole DSLR scene. They are not the best and most convenient run and gun cameras, but they are light-weight and offering up a VistaVision sized sensor in a consumer DSLRs with a 22MP stills capability in the same box. If I could only take one camera to a desert island with me, it would probably be the DSLR because of it’s versatility. I am totally with you on the monster rigs. The art of good design is simplicity. I don’t believe we’ve seen the ultimate design yet… all the rigs seem like Heath Robinson style compromises in one way or another but I am impressed with some lines of development – it takes time. As it does for DSLR filmmakers to reach Sundance. This is a young movement and it needs time to find it’s feet. It’s about affordable, accessible gear and simplicity – you and a camera, with interchangable lenses and a large sensor. A prosumer camcorder cannot compete in terms of low light and shallow depth of field, which is a much bigger flaw than ergonomics or lack of auto-focus. Also remember that moire / aliasing is not a big issue – the Panasonic GH2 doesn’t have any that is even moderately severe. The GH1 never had anything noticeable either but because of the Canon offerings it became as widely bandied about as the term DSLR itself and the two became synonymous. I should point out also that aesthetics like shallow depth of field are not important for ‘getting a shot’ but they are importing in other regards. If a shot is worth getting, it’s worth getting cinema style, surely! Great post. While the look is nice, I don’t think VDSLR is an easy run and gun rig. I still prefer a traditional camcorder – even a Flip – for my corporate communications work. One of those VDLSR rigs would scare the crap out of my employees and they would clam up so fast it would make employee video pointless on our intranet. What’s nice about blogging and commenting is that when all’s said and done, readers get the truth, which we all want and need, whether we like it or not. I’m a nobody that has been inspired by the new trend in cameras. Camcorders can give you a photo (pre and post), but the quality/control of the result isn’t convenient or possible (at least if you have more than average joe’s concept of a good photo). Cameras didn’t have video because they were dedicated to their film and mechanical SLR (single lens reflex) technology. Now we have digital (sorry Kodak), and now SLR is dying (sorry Nikon etc). It’s only a matter of time until EVF and live view are perfected. I won’t be surprised if in 100 years, the glass lens disappears (electro-magnetic). For me, the inspiration now comes from the following TOGETHER. 1) digital flexibility (HUGE!!! ), 2) changeable lenses (old flexibility), 2) micro43 smaller size and lens universality, 3) distribution HD and other video formats, 4) HD photos too, 5) SD cards (not tape). The frankenrigs are just expressions of intelligent creative people playing with an inspiring new toy that allows them greater freedom and control (however awkward it might appear and truely be). I’ll never build-up such a monster for my hand-held interests, but I might do something similar for trying to capture footage of illusive mammals in the forest –especially wireless where I can operate at a distance. There was a huge gap between television and family snap photos. Now with everybodies text-photo-video internet-working competing with television and film, these new hybrid digital cameras are simply the tool to make the transition to “telenet” easier and faster. I’m not surprised at the apparent dumbness of the feature sets of various cameras. Pretty soon, everybody will be producing content for everybody, and the big industry will loose its fizz like the music industry. It’s important to note that dogma is anti-creative, but it represents stability and security in the physical and economic world. The big-business world that bought the expensive industry cameras has been changing a lot of the past years. I fully agree with your article. However – I shoot with a Canon 550D (T2i) and just the 18-55 kit lens and a 50mm 1.8. Nothing else. That is my run and gun kit. I have shot short films on that. However – I get away with that because I do 100% ADR and foley. If I’m doing interviews or anything requiring live audio then I shoot on my AF-100. I hear your grievance but comparing DSLR rigs to an ENG camera is a bit misleading. If you’re shooting the news or weddings you can’t beat a 2/3″ shoulder camera. That said, for many of us that use dslr’s shoot drama, promos, spots and videos. Our clients don’t prefer the 2/3″ and like something more cinematic. I’ve shot extensively with 5D’s and we strip them down. I don’t rig sound gear to it because, in the fiction world, someone else does it for good reason. We’ve place these cameras in places you’d never dream of getting a fulll size 2/3″ or 35mm camera in. I do agree that some of the rigs you pictured defeat the purpose of a dslr’s form factor but I do think that ReWo cage with the Vocas grips is actually a very clean, tight get up that takes advantage of a dslr’s size. As someone who owns a Red and uses Alexa’s all the time, this set up has some distinct advantages.